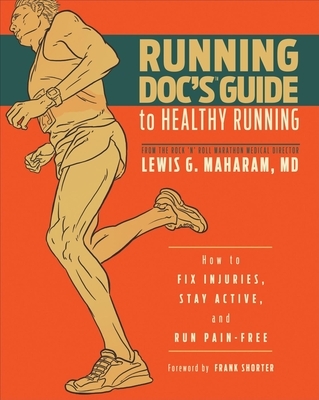 Running Doc's comprehensive book on running injuries can help you solve your aches and pains for years of healthy running. For a runner, injury is a terrible fate. Yet every year, nearly half of America's runners suffer an injury severe enough to bring them to a halt. Trust the Running Doc z to get you back on your feet. Dr. Lewis G. Maharam, MD, is the most trusted authority on running health and running injuries, and his guide will help you avoid or fix nearly every common running-related injury. If you're already injured, Running Doc's book will help you diagnose, treat, and recover to run pain-free. From head to toenails, Running Doc's Guide to Healthy Running is the most comprehensive guide to running injuries and preventative care. Running Doc offers simple, effective treatments for every common running injury and also delivers easy-to-follow advice on the best way to prepare for and enjoy running events of all types and distances. No matter your malady, Running Doc has got you covered. Get healthy and get back on your feet with Running Doc's Guide to Healthy Running. Lewis G. Maharam, MD is one of the world's most extensively credentialed and well-known running health experts. Better known as The Running Doc, Maharam is the medical director of the Rock 'N' Roll Marathon series (19 races and over 380,000 entrants nationwide projected for 2011) and the former medical director of the New York Road Runners and the ING New York City Marathon. He is Chairman of the Board of Governors of the International Marathon Medical Directors Association (IMMDA) as well as National Medical Director for the Leukemia-Lymphoma Society's Team in Training program. He has appeared on World News Tonight, Today, Good Morning America, Inside Edition, CNN, and Fox News. Maharam is a frequently cited source of medical advice by writers for "Sports Illustrated, Fitness Magazine, Self, Shape, Redbook, Time, Newsweek, New York Times, USA Today, New York Daily News, Newsday, Conde Nast Sports for Women, Glamour, Cosmopolitan, Jane, Men's Journal, Runner's World, Woman's Day, McCall's, Reader's Digest, New York Post, Allure, US News and World Report, Cooking Light," and more.